Very cute little witchy owl! Thanks for playing with us at the Friday Mashup. I love your very adorable owl card for Halloween. Your little witch owl is adorable, very nice card. Love your purple Owl Rita! Great layout too!! Thanks for playing with us at the Mashup! What a fun Halloween card. 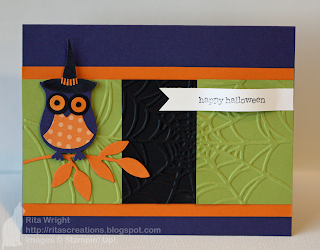 That owl is just too darn cute and I love the embossing. Love Love Love that.. Witches hat on the OWL!! So cute, and right up my alley since I love all things Witch! You really used the color combo perfect.. Just the right amount of each color. Thanks for joining us at the Friday Mashup! Love how the spider web goes over the limeade and black! Great detail! Thanks for joining us at the Friday Mashup!